Hi friends, below are my collection on articles of faith. These are great faith building articles which will help you to increase your faith in God. Our entire relationship with the Father, the Son, and the Holy Spirit is based on faith. Our salvation comes from faith. Everything in the kingdom of God is by faith! Hebrews 11:6 says, "But without faith it is impossible to please Him. For he that cometh to God must believe that He is, and that He is a rewarder of those who diligently seek Him." God loves your faith! The more faith you have, the greater His joy! I pray that as you read these articles of faith, your faith in God will be more than ever before! With a boy, his five loaves of bread, 2 fish, Jesus could use it to feed a multitude of 15000 people. Learn to have faith in God, trust Jesus and watch how he can transform what's little into much. What To Do When God Doesn't Answer Prayers? When God doesn't respond, it doesn't mean He is not listening. When your prayers are not answered, it doesn't mean He does not want to give you. To receive a miracle you have been longing for, you need to have faith and keep praying. Learn the powers of a persistent prayer. Thanksgiving is an extremely powerful key to spiritual breakthrough. Thanksgiving is a showing of your faith towards God and expressing your gratitude for believing that God will give you a miracle for your needs. Learn the four reasons why we give thanks. Seeing Is Believing. Or Is It Not? Thomas, one of the apostles, is most remembered because he was slow to accept anything as truth without sufficient evidence. The faith of Thomas: seeing is believing. What God wants to see is us believing before seeing. Miracles were so normal in the Ephesian church that God started working unusual miracles among them. But why is it that we don't see miracles or healings take place regularly in our churches today? Is Spiritual Healing Still Available? Spiritual Healing was so common in the gospels, when Jesus and the apostles healed the sick all time time. God is our healer in the Biblical times, and He is still the same yesterday, today and forever. Prayers and faith moves mountains. Be a prayer warrior. Start mixing your intercesstion with your faithful tithing and generous giving as a Memorial Prayer before the Lord. Four times in the Bible that declares to us the righteous or just shall live by faith. If we can apply this simple truth to our lives, it can revolutionize our lives and our ministry in the kingdom. The faith we all need is the faith of Abraham, or heart-faith. Abraham did not consider mere physical knowledge or natural facts. He only valued the spiritual truth of God's Word. The source of faith is always God's Word. But there is a supernatural "mountain-moving" gift of faith that comes through a Spirit-given revelation or the Rhema Word of God. In the midst of a severe drought, Elijah was sent to a widow in Zarephath. Learn how this widow of zarephath acted upon the word of God and gave her way out of lack into supernatural abundance. King Ben-Hadad of Syria besieged Samaria in the midst of a severe famine. 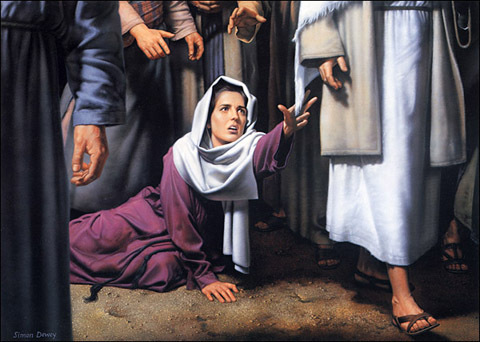 So desperate was Samaria's plight that people ate almost anything in order to survive. Learn about how the four lepers saved the entire Israel and the faith we should have. Many Christians don't really understand what happens when the Lord's Supper takes place. Possibly due to an overreaction against Roman Catholicism. Let's review the truth about the Lord's Supper. What is the secret of abundance? What unlocks the riches and prosperity that God has in stalled for us? Stretching Your Faith is like stretching your muscles. The more you stretch them, the greater your faith will be. The opposite is also true, the less you stretch your muscles, the weaker your faith. I will be adding more and more articles of faith in time to come. Please come back more often to check them out! Return From Articles of Faith, to Holy Spirit Led Christian.